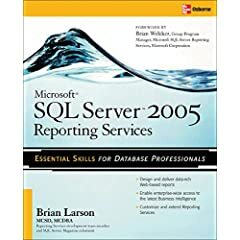 This excerpt from Chapter 5 of the book Microsoft SQL Server 2005 Reporting Services 2005 explains how to work with Repair Count by Type reports. Now let's move down the road a little further and create a matrix report without the wizard. GDS needs to purchase several new transports to update their delivery fleet. The company must decide which type of transport to purchase. One factor in the decision is the amount of time the new transports will spend in the maintenance hanger for repairs and preventative maintenance. Upper management has asked the GDS maintenance department to provide a report showing the number of each type of repair required by each type of transport. The report should include statistics from all transports, both active and retired. Also, the report should group the repairs by their cause. If you closed the Chapter05 project, reopen it. In the Solution Explorer on the right side of the screen, right-click the Reports folder. Put your mouse pointer over Add in the Context menu and wait for the submenu to appear. Select New Item from the Context menu. This displays the Add New Item Chapter05 dialog box. Make sure the Report icon is selected in the Templates area. Enter RepairCountByType for the name. Click Add. A new report called RepairCountByType.rdl is created in the Chapter05 project. You are taken to the Data tab of this new report. Select from the Dataset drop-down list. The Dataset dialog box appears. Enter RepairsByType for the name in the Dataset dialog box. Galactic (shared) is selected for the data source by default. Click OK. You return to the Data tab, which now displays the Generic Query Designer. Click the Generic Query Designer button to switch to the Graphical Query Designer. Right-click in the diagram pane of the Graphical Query Designer screen. Select Add Table from the Context menu. Click Close to exit the Add Table dialog box. In the criteria pane, type TypeOfTransport in the Alias column in the Description row. In the criteria pane, type TypeOfWork in the Alias column in the Description row for the WorkDone table. In the criteria pane, type RepairCause in the Alias column in the Description row for the RepairCause table. Task Notes Although this report is a pretty straightforward request, we need to link together a number of tables to collect the necessary data. What we are interested in is repairs, so we start with the Repair table. However, none of the fields we need in the result set are in the Repair table. To find the type of transport being repaired, we need to join the Transport table with the Repair table, and then join the TransportType table to the Transport table. To find the type of work done, we need to join the RepairWorkDoneLink table to the Repair table, and then join the WorkDone table to the RepairWorkDoneLink table. Finally, to group by the cause of the repair, we need to join the RepairCause table to the Repair table. If you get confused by all of this, refer to Figure 3-23 in Chapter 3. Click the Matrix report item in the Toolbox. The mouse pointer changes to a matrix icon and crosshairs when you move your mouse pointer over the report layout area. Click-and-drag the mouse over the lower three-quarters of the report layout. When you release the mouse button, after dragging, a matrix is created to occupy the area you just defined. By default, every cell in the matrix is occupied by an empty text box. In the Datasets window, expand the RepairsByType dataset. Drag the TypeOfTransport field from the Datasets window and drop it on the cell containing the word "Columns." The values in this column in the dataset determine the columns in the matrix report. Drag the TypeOfWork field from the Datasets window and drop it on the cell containing the word "Rows." The values in this column in the dataset determine the rows in the matrix report. Drag the RepairID field from the Datasets window and drop it on the cell containing the word "Data." Click the Preview tab. Your report should look similar to the following illustration. The rows and columns in your report may appear in a different order from those shown here. Task Notes Because the matrix report always groups a number of records from the dataset to create the entries in the matrix, the field that supplies the data for the matrix must be enclosed in some type of aggregate function. If the field placed in the data cell is a number, Report Designer encloses the field in the SUM() aggregate function. The RepairID field, which we placed in the data cell in Step 7, is a number. However, it does not make sense to add up the RepairIDs. Instead, we want to count the number of RepairIDs. For this reason, we changed the SUM() aggregate function to the COUNT() aggregate function. Click the Layout tab to return to the report layout. Click the square in the upper-left corner of the gray border to select the matrix item. In the Properties window, click the Property Pages button shown in the following illustration. The Matrix Properties dialog box appears. In the Rows area, click Add. The Grouping and Sorting Properties dialog box appears. Next you set up your matrix for drilldown. Replace matrix1_RowGroup2 with matrix1_RepairCause for the name. Select Fields!RepairCause.Value from the drop-down list in the first row under Expression. Click OK. In the Rows area, click Up to move matrix1_RepairCause to the top of the list. Click the matrix1_TypeOfWork entry. Click Edit in the Rows area. The Grouping and Sorting Properties dialog box appears. Click OK in the Grouping and Sorting Properties dialog box. Click OK in the Matrix Properties dialog box. Your report layout should appear similar to the illustration. Click the Preview tab. The report should appear as follows. If the report displays an error message mentioning textbox2 when you preview the report, then textbox2 was not the name assigned to the text box containing the RepairCause group label. Return to the Layout tab and select the text box containing the =Fields!RepairCause.Value expression. Look at the Name property in the Properties window. Return to the drop-down list you populated in Step 9 of this task and replace textbox2 with this name. Click OK to exit the dialog boxes and preview the report again. Click Save All in the toolbar. Task Notes The Property Pages button in the Properties window provides an alternative way to change the properties of a report item. This button displays a dialog box that deals specifically with the properties of the selected report item. These specialized property dialog boxes can make it much easier to modify the properties of a report item. You can also access the specialized property dialog boxes by right-clicking a report item and selecting Properties from the Context menu.